Best selling author Katie Crabapple donates proceeds of her upcoming release to help save a young boy. 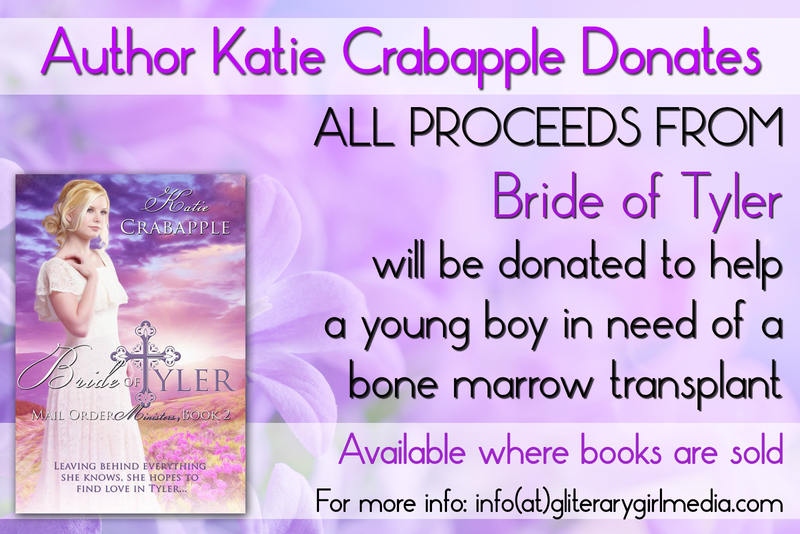 Inspirational romance novelist Katie Crabapple will be donating a portion all proceeds from her upcoming release, Bride of Tyler, to a nine year-old boy suffering from Fanconi Amenia. In an effort to help Tyler’s family afford after care for a bone marrow transplant he desperately needs, a portion of all sales from Bride of Tyler will go into this fund. Katie finds a particular kinship with this family because not only is Katie a mother to a young boy herself, but the family hails from Wisconsin, Katie’s hometown. About Bride of Tyler: Bride of Tyler is a story about a shy young woman who takes a chance by agreeing to marry a virtual stranger. She tries to find love in the only way she feels is open to her and marries a minister from Tyler, Texas. It’s a journey that causes her to question a faith she had very much believed was solid and strong. Katie Crabapple is a Christian homeschooling mom who loves to write. She believes that love is the center of mans walk with God and wants to share simple lighthearted stories about finding ones soul-mate within God’s family. She believes that God gave us everyone sense of humor for a reason, so she inserts a little bit of wittiness into her imaginative and inspirational stories.